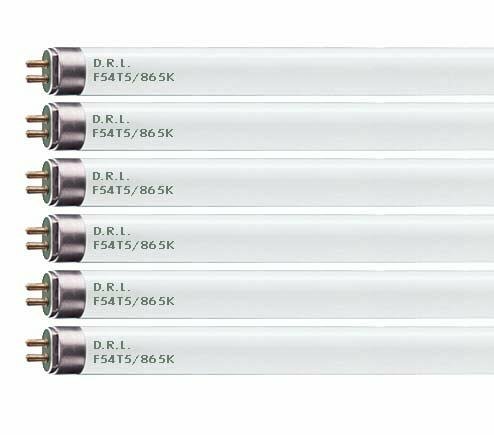 When it comes to lighting systems, the D.R.L 54-watt F54T5/HO/865 T5 linear fluorescent tube features a high lumen output while producing a whiter, more natural color for either commercial or residential applications. It has a stark white color temperature of 6500K and an average life of 20,000 hours. This fluorescent tube is perfect for high or low installations and can help you save energy with a proper ballast. For residential and commercial applications that require high color quality, an F54 T5 high-output fluorescent is what you're looking for. With a 6500K color temperature and a CRI of 85, this 20,000-hour T5 high output fluorescent lamp is suitable for warehouses, packing facilities, and stack aisle applications and at illuminating color appearance. If you have any questions about this product by D.R.L, contact us by completing and submitting the form below. If you are looking for a specif part number, please include it with your message.